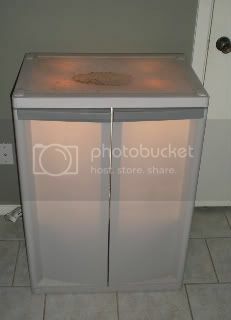 This is a seeding cabinet I built awhile ago out of a sterilite garage cabinet and a few other items. It was a really easy build and didn't cost much. I really like being able to start seeds in a small space inside with a somewhat controlled environment. And I typically have very high germination rates in the cabinet. Looks pretty nice. Other than cosmetics, I don't quite know what having the doors on it adds, especially when you are using humidity domes. The lights seem very high above the seedlings; can the shelf be raised and lowered? 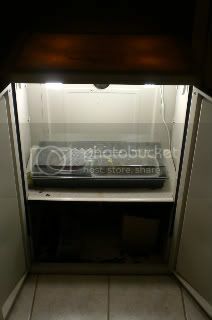 You could easily turn this into a double decker-- two shelves with lights hung from the bottom of the top shelf to provide lighting for the plants on the bottom shelf. Then you would have twice the growing space in the same cabinet/ footprint. Thats very nice and here is one very similar. The doors don't do a whole lot. I have it in a space where it wouldn't bother anyone having the extra light all the time. And since it's not painted a lot of light shines out, anyway. And yes, you can raise or lower the shelf. But despite the height between the lights and seedlings I never have any stretching. Right now I'm using the bottom space as storage. I used to have the taller sterilite cabinet rigged for the same thing. I could propagate in the bottom space and grow plants out a little in the top space. I think something like that would be great for an early start for fall and spring crops if the timing was just right and nothing got too big in the cabinet. Right now that old cabinet is out of commision and is being used for storage. I like your cabinet. Lots of trays in there, very efficient use of floor space. Did you ever figure out the heating/cooling? If you use an aquarium you may be able to use it as a sort of heat sink in warm months and heating in cool months by putting in a small water pump and tubing running up one side and back into the aquarium.